This is my 500th post and it is befitting that I write about one of my favorites! It is no secret I love Veggie Grill. From the very first time I tried them six years ago, I have not lost my desire to eat this absolutely delicious vegetarian fare. 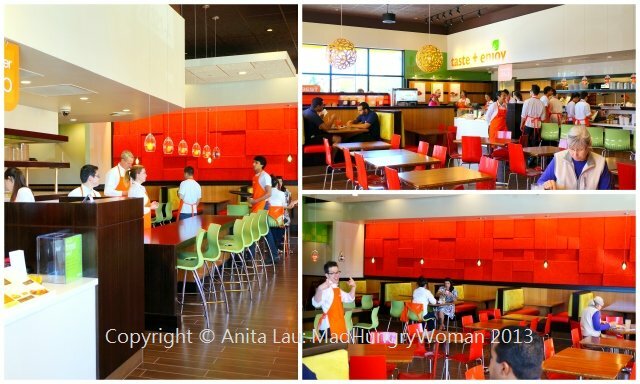 Their latest location in Laguna Niguel is just another reason to give Veggie Grill a try if you haven’t already been introduced to them. I love how each location has its own unique decor while still keeping in tune with its signature style and colors. 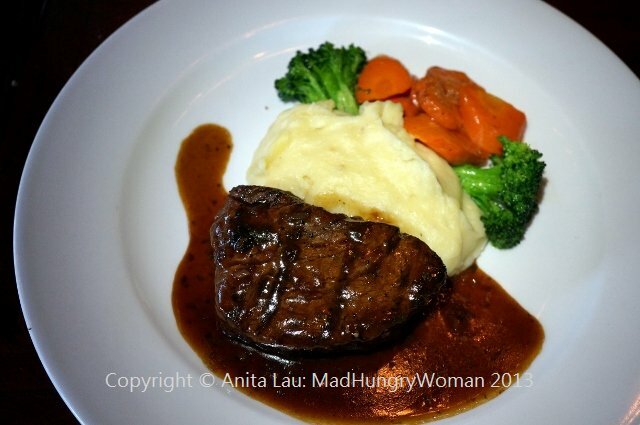 I’ve positively had everything on the menu and although 90% of the items I love, there are definitely some that are dearer to my heart than the others. 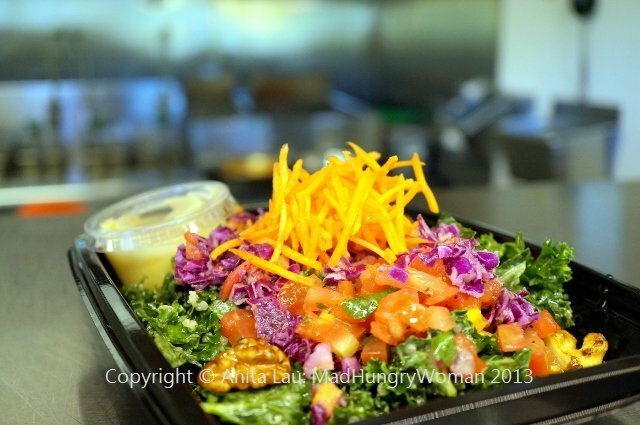 If you are a salad fan, there are lots to choose from starting with the Thai Salad ($9.95). 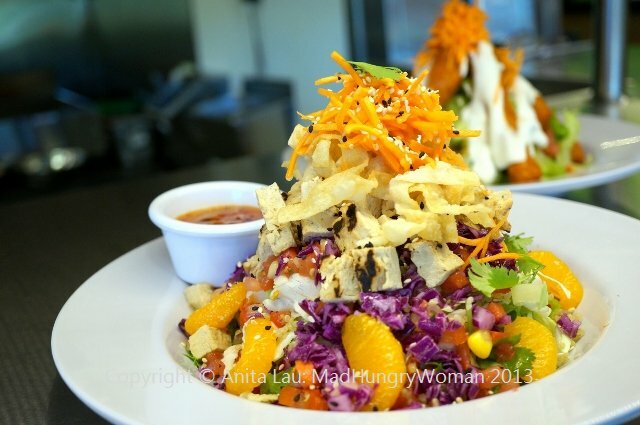 Romaine, cabbage, corn salsa, green onion, mandarin oranges, sesame seeds, cilantro, wonton strips are tossed in a spicy Thai dressing and topped with with either grilled chickin or tempeh. 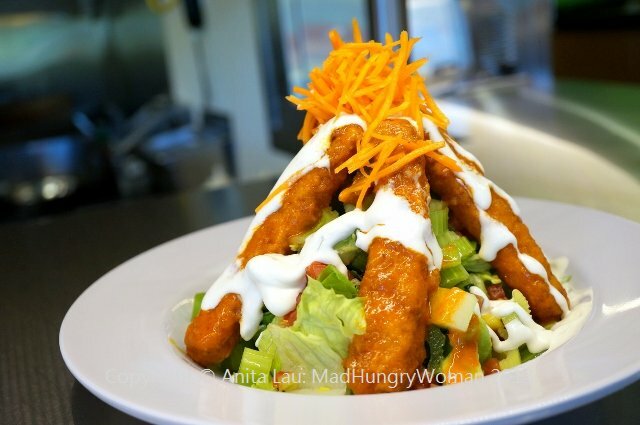 I love the buffalo wings and you can have them on a salad by ordering B-Wing Salad ($9.95). These deliciously spicy tart buffalo wings are served over chopped romaine, avocado, celery, toasted corn salsa in a creamy ranch dressing. So mouth puckering good! One of my favorite salads is the All Hail Kale ($7.25 lunch size/$8.95 entree size). Not only is it healthy, but it is so delicious as well, so good that even my son loves it. Marinated kale and red cabbage are chopped into bite-sized pieces and tossed with corn salsa, agave roasted walnuts in a ginger papaya vinaigrette. You can add tempeh or blackened chickin for $2.75. 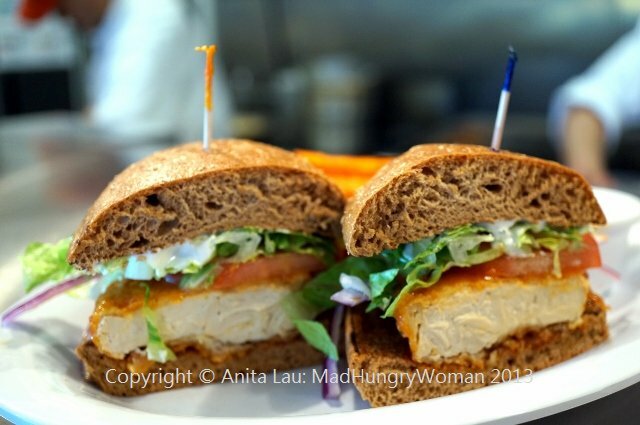 If salads aren’t your thing then I suggest getting a sandwich. 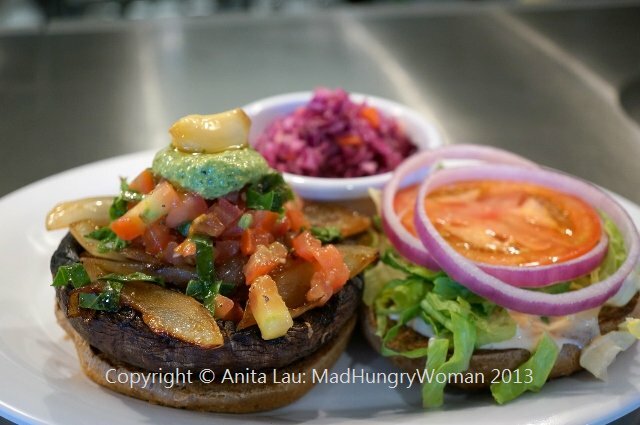 Papa’s Portobello ($8.50) consists of a large meaty grilled mushroom, topped with chopped tomato, basil and garlic pomodoro, caramelized onions, pesto, lettuce, red onion and drizzled with chipotle ranch. The All American Stack ($8.95) is one of my son’s favorites! Grilled veggie steak, pickles, lettuce, tomato and crispy onion rings topped with thousand island dressing complete this burger. If you’re a fan of the buffalo wings like I am, then you’ll love the Buffalo Bomber ($8.95) with a crispy chickin’ pattie tossed with spicy buffalo sauce assembled with tomato, red onion, lettuce and creamy ranch dressing. So so good! If you just want the buffalo chickin on its own then totally order the Buffalo wings ($6.95). 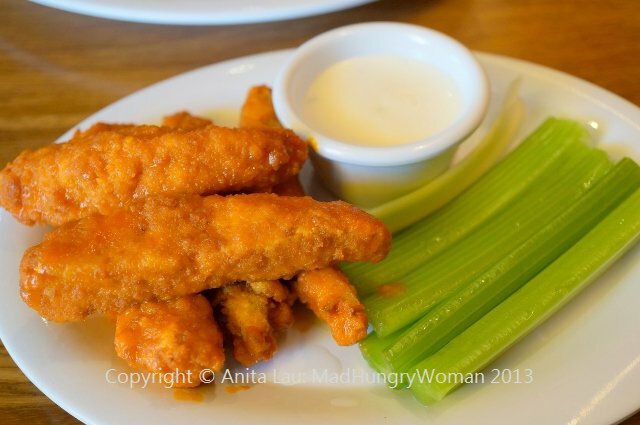 These chickin strips are served with celery sticks and creamy ranch dressing and I always order them on every visit. Chill Out Wings ($6.50) are another favorite. 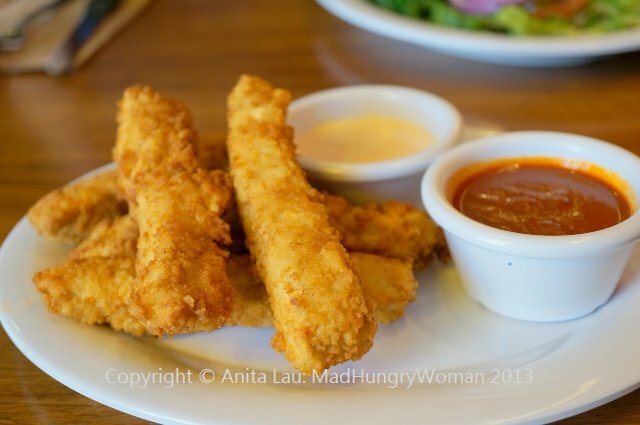 These are the fried chickin strips served with tangy BBQ sauce and chipotle ranch. My son usually orders two serves of this but ends up sharing them with me in exchange for my buffalo ones. There are also entree style plates such as Crispy Chickin’ Plate ($9.95) is so good you wouldn’t even miss the carnivorous kind. Fried chickin with cauli-mashed potatoes are accompanied by a flavorful porcini mushroom gravy with fresh rosemary and served with a side of steamin’ kale. For me, this is comfort food without the cholesterol! Blackened Chickin Plate ($9.50) is a nicely charred piece of chickin topped with papaya salsa and served with steamin’ kale and quinoa pilaf. Talk about healthy! 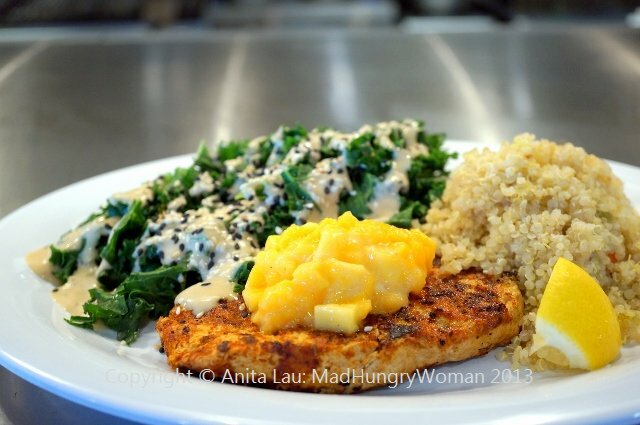 This is a totally guilt-free and filling meal. if you’re not full yet from everything, you can try some of the desserts on offer. 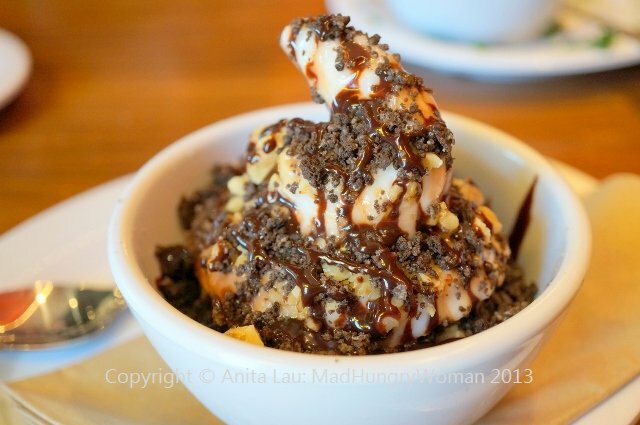 The new soft serve — vanilla, chocolate or swirl (with or without Oreo crumble) — is a good choice and kids love it! 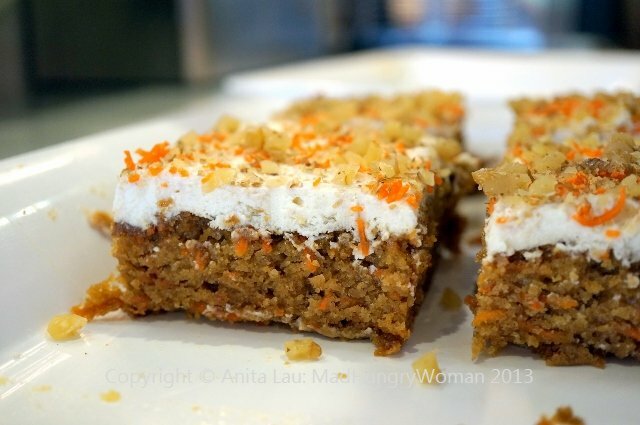 Or, the carrot cake is absolutely delicious! None of the desserts are overly sweet which appeals to me! 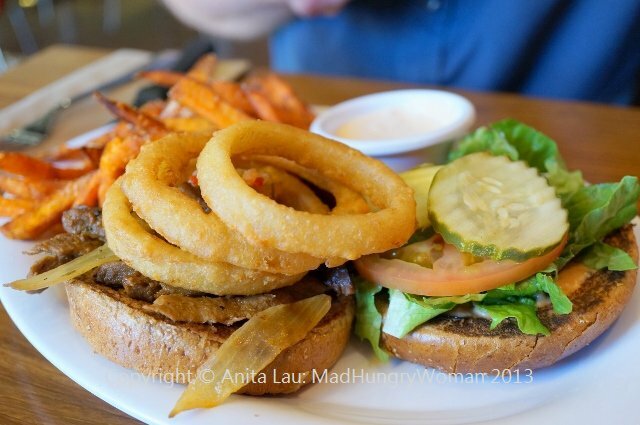 If you haven’t tried Veggie Grill yet, here’s a chance for you to do it. I have two $15 gift cards to give away courtesy of Veggie Grill. Leave me a comment with your FULL name and tell me whether or not you’ve been before and why you love it, or, if you haven’t, then why you would like to try! Entries end on Friday, May 3rd. 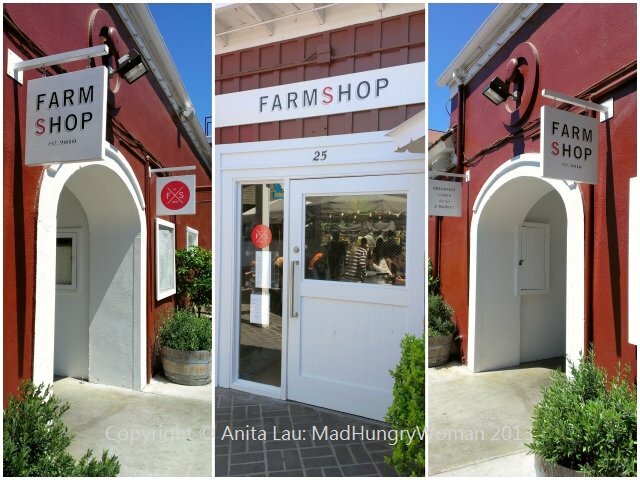 It was The Hungry Dogg‘s birthday, so we made the trek up to LA to lunch at Farmshop, a place which has been on my list to try for a very long time. Stupidly, we didn’t think to make reservations and waited 45 minutes for a table. 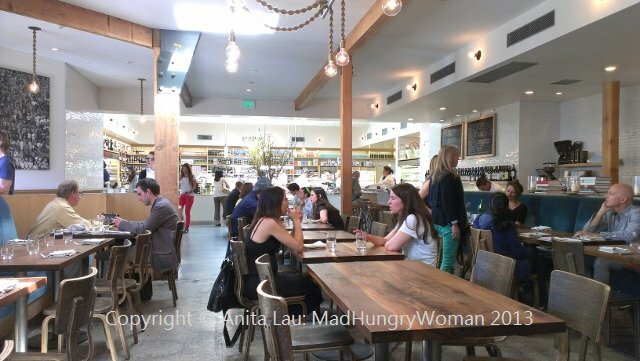 Luckily, the market area kept us occupied, not to mention the celebrity sightings — Ted Danson and Mary Steenburgen were lunching with friends — which made the wait tolerable. The hostess was very sweet and apologetic, especially after she found out we were celebrating a birthday. After we were seated, we proceeded to order right away, after all, we’ve had 45 minutes to peruse the menu and had pretty much decided what we wanted. The birthday boy ordered an Red Eye Martini ($14) with fresh Madagascar vanilla bean infused soju and LAMill cold brewed coffee. Although we had expected the cocktail to arrive prior to our meal, we didn’t get it until after our last dishes arrived. The drink tasted like an iced coffee with barely a hint of alcohol. 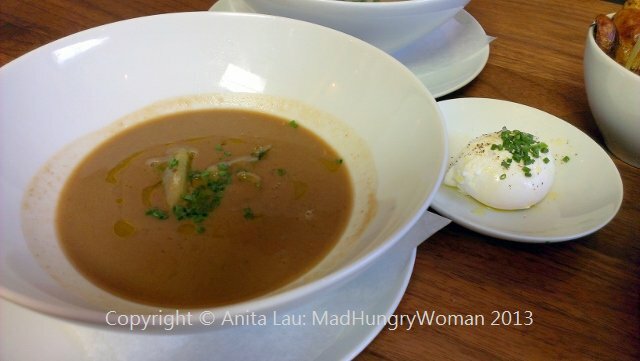 Brown Umbrian Lentil Soup ($12) was flavorful and they were kind enough to split it for us (even though we didn’t ask for it). They brought the poached hen egg on the side — not sure if that’s the way they served it or it was done for our benefit because they had split the order. Tasso ham bits were found in Austin’s bowl, but not mine so I ended up fishing out some to taste. A sliver of chicories — not sure which kind — was also floating in our soup. I liked the taste but wished they had left some lentils whole for textural contrast. We ordered the Fried Weiser Farm Potatoes ($10.50 full portion) as a side portion. 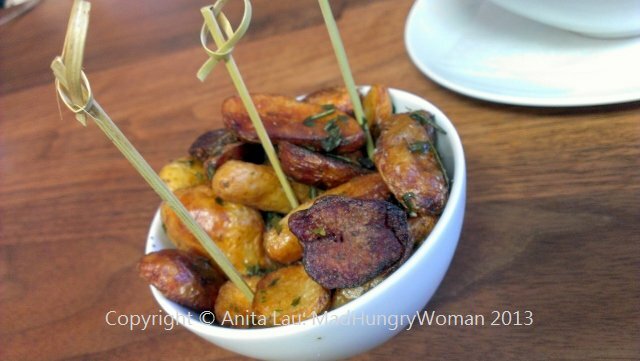 Nothing special, and they forgot to bring the accompanying housemade ketchup, wild herbs and aioli with the potatoes. I waited a few minutes and still didn’t see it so asked the server for it. 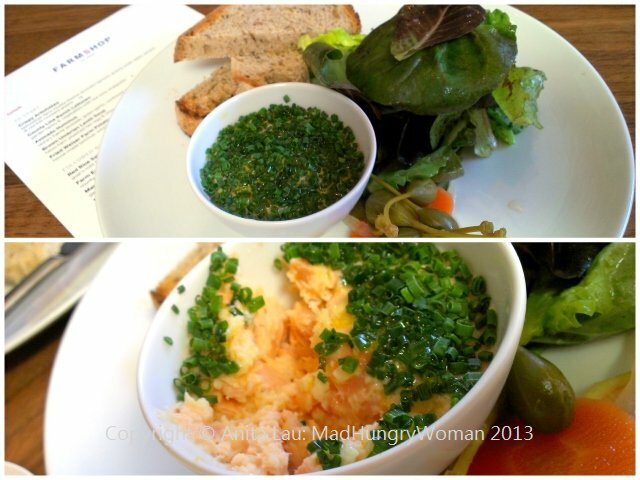 Our favorite item of the meal was Potted Fresh & Smoked Salmon Rillettes ($17.50). Perfectly seasoned with a nice smokey taste without being overpowering and the fresh chives added a nice freshness. Served with toasted rye bread, caper berries, pickled vegetables and baby lettuce. 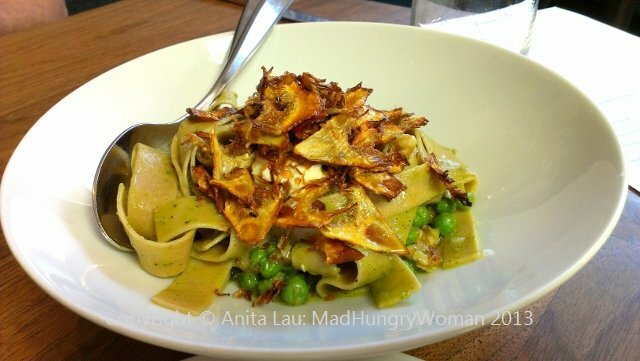 The Community Grains Pappardelle ($20) sounded great on paper with English pea and their greens, local walnuts, sheep’s milk ricotta and crispy fried artichokes. Unfortunately, the entire dish was dry and underseasoned. At $20, not only was it expensive, but it was one dimensional and bland which was very disappointing. I brought it home and tweaked it by adding some salt and a bit of moisture so not to waste it. Steak Sandwich ($18.50) is served medium rare, but it was pretty raw in the center. 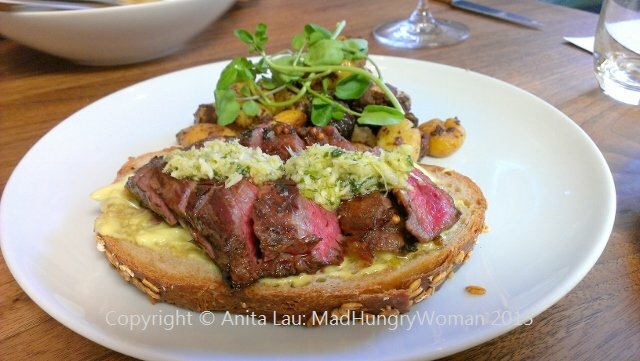 Again, the coriander marinated skirt steak was under-seasoned and if you didn’t get some of the horseradish salsa verde on your mouthful, there was no taste. The ladies sitting next to us sent theirs back because it was too under-cooked, but we had to get back on the road so we packed that up as well. Overall, disappointing considering the price point of the dishes. Our meal was over $100, tip included for two with one cocktail and mediocre service. Based on this visit, I’m in no hurry to return any time soon. It’s been years since I was last at Brasserie Pascal, but recently, a bunch of my friends and I came here to try their Sunset Menu which offers two entrees at the mere cost of $13 each. These items are offered between 4 and 6pm and is a great item for people who want something delicious and affordable. 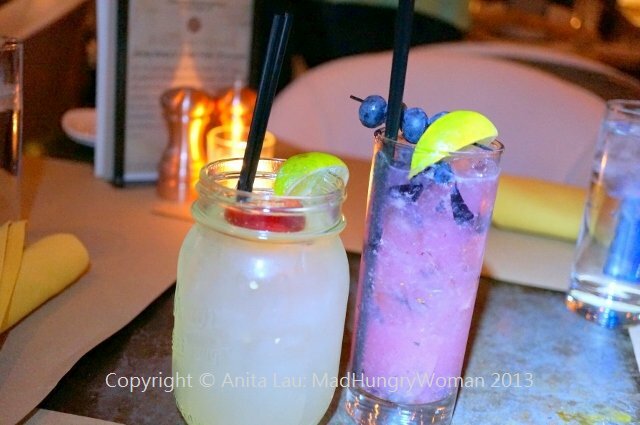 As we perused the menu, we ordered some cocktails to start and found some innovative creations such as Pomegranate Skinny Margarita ($13) and at 140 calories, you can have several of these without feeling guilty. 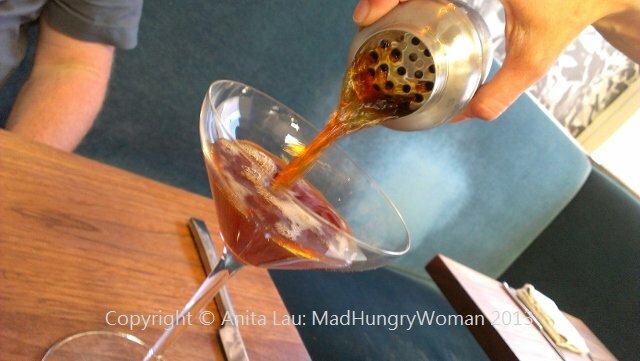 The other was Not Your Daddy’s Manhattan ($13) which The Hungry Dogg was more than happy to try. Since there were only two entree items on the Sunset Menu, we decided to also partake in the $19 three-course prix-fixe as well, which is a constant fixture on the menu regardless of what time you’re dining. 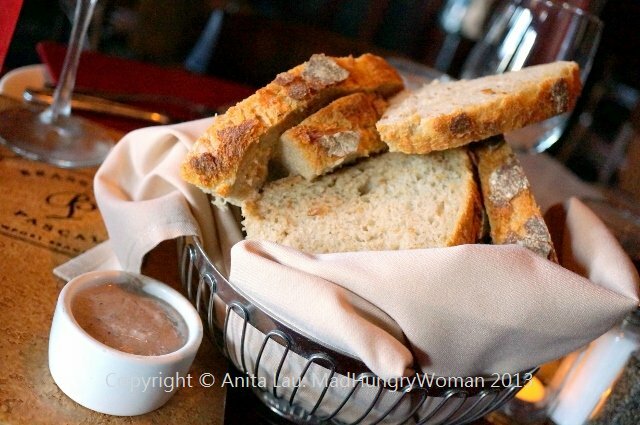 Some delicious bread was placed on the table and this grainy, crusty bread was served with a tapanade spread which we replenished several times while waiting for our food. 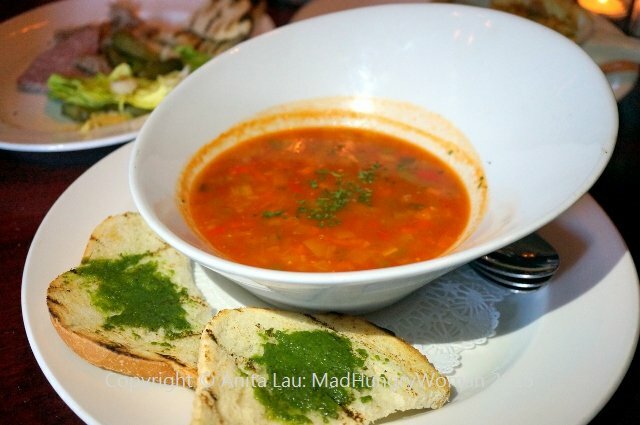 The prix-fixe offers four choices of appetizers, two soups: Soupe du Jour or Soupe l’Oignion (soup of the day or French onion soup), a green salad or Pate/Rillettes plate. 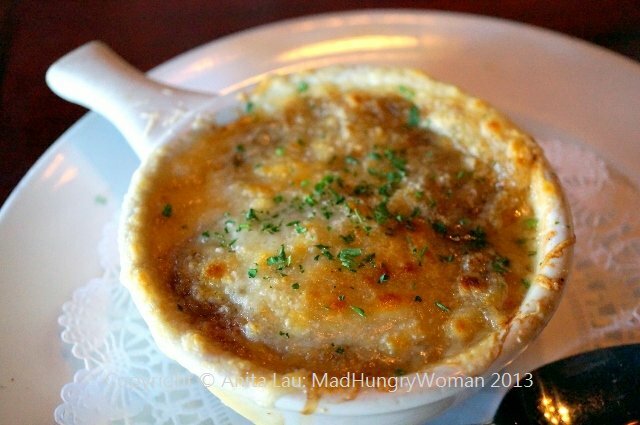 I didn’t care for the French onion soup. It was just okay and lacked depth. The pistou was absolutely sublime. This vegetable soup was flavorful and filled with all the goodness of seasonal vegetables and beans. 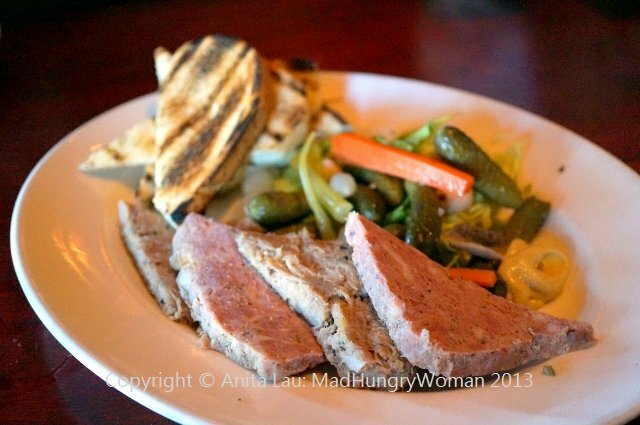 The Rillettes was decent, needed a little more salt, but overall, good and a generous portion. For entrees, there were three choices. 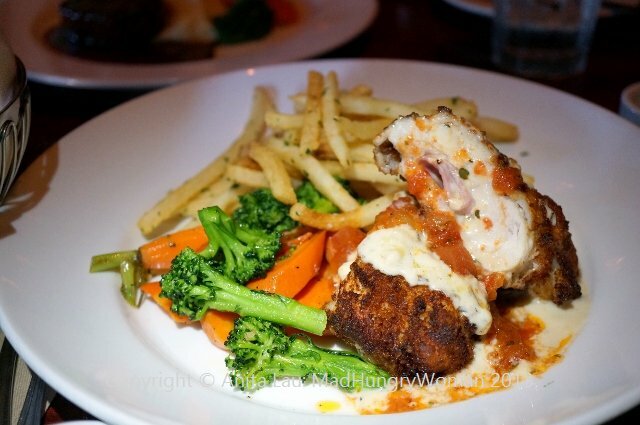 Since we were also having the two entrees from the Sunset Menu, we decided to choose the Chicken Cordon Bleu since the other two were steak and salmon — the same proteins except prepared differently. 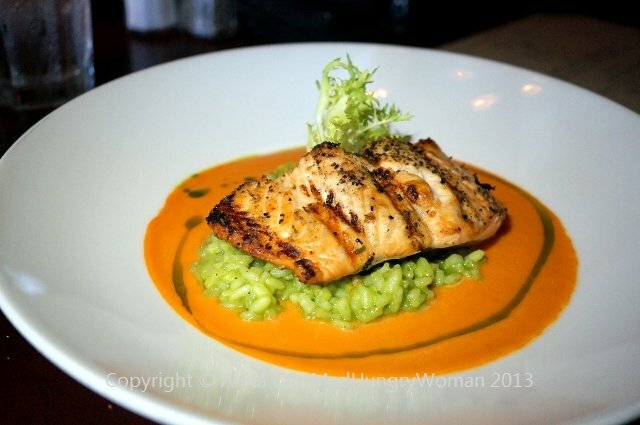 From the Sunset Menu, the salmon ($13) is grilled and served over a bed of basil-pesto risotto and tomato coulis. If you like your salmon medium rare, please let your server know when you order because it does arrive medium well otherwise. The tomato coulis was magnificent I wanted more of it. The Sunset Menu’s Filet Mignon ($13) is served with gruyere potatoes au gratin, with lightly buttered asparagus and Pascal’s “secret” sauce. I would recommend getting the sauce on the side because it consists of cumin and might not be everyone’s cup of tea. 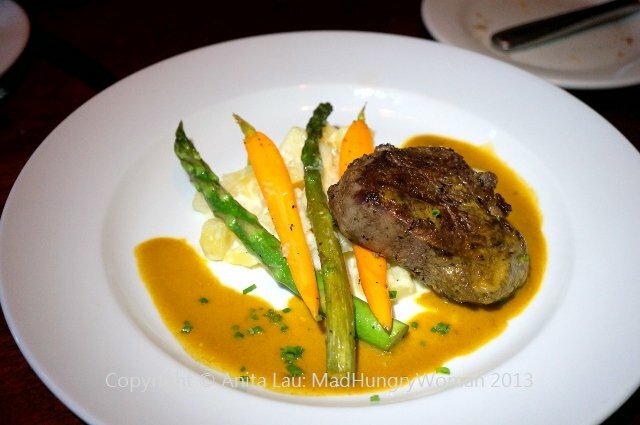 The prix fixe menu’s Filet Mignon is served with mixed veggies, pomme puree (potato puree) and a rich Bordelaise sauce. The steak was nicely prepared and again, a really good portion. You will not leave hungry. 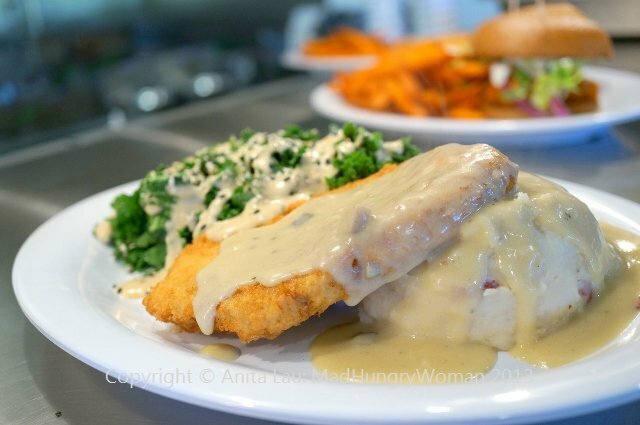 Chicken Cordon Bleu with sherry cream sauce is tasty, but a little heavy for me. Served with mixed veggies and French fries, you won’t be disappointed if you’re looking for this traditional French favorite. 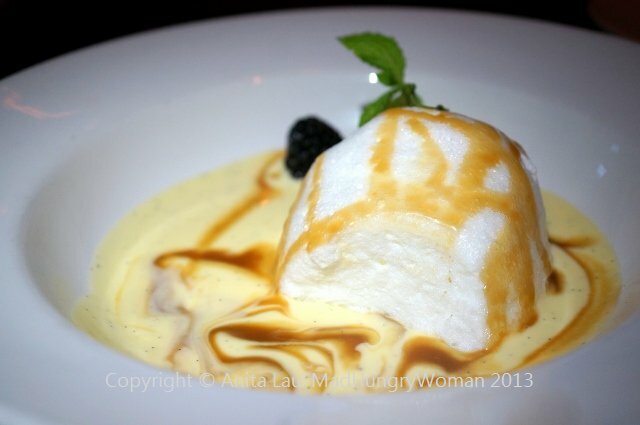 Ile Flottante is a soft meringue floating on top of a pool of creme Anglaise. When it arrived I remember eating this before but the name had something to do with “snow”. I did a little research and found that it is also known as “oeufs a la neige” and that was the dish I remembered. I also remembered not liking it much because I am simply not a fan of meringue anything. 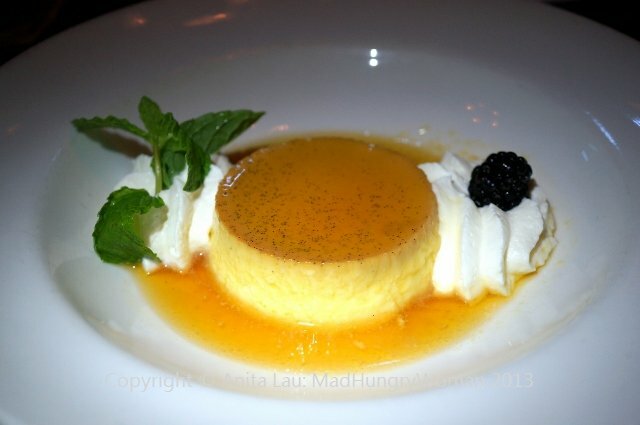 I love custard or flan and Creme Caramel is every bit the dessert I remember eating as a child. 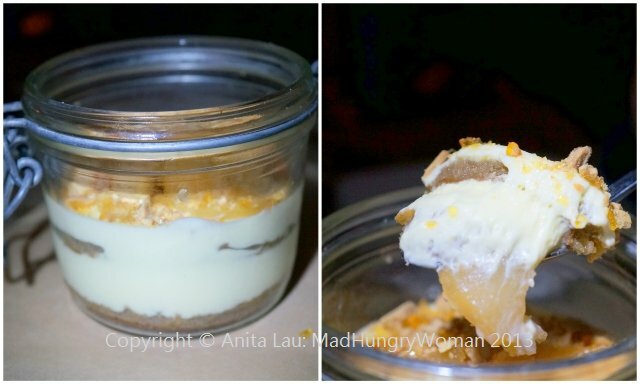 The custard part is a little denser than flan but it isn’t super sweet so it was very enjoyable. 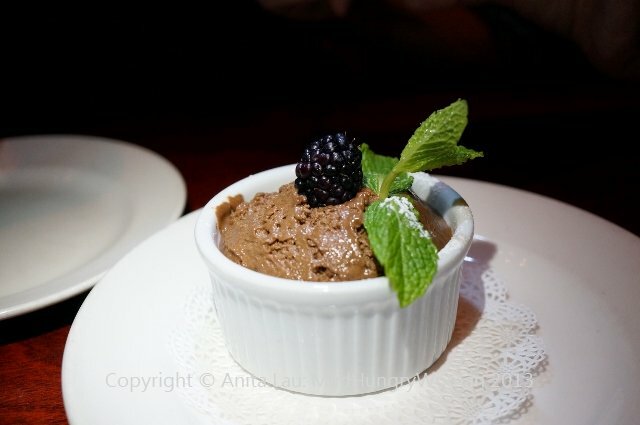 Chocolate Mousse was absolutely my favorite. 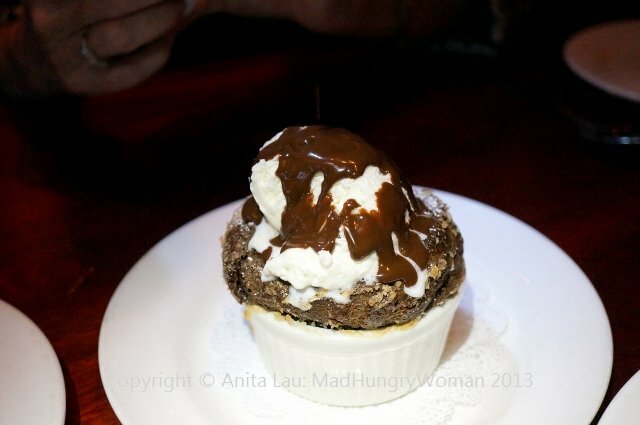 Light and airy, it was rich in chocolatety flavors and I would choose this again should I order the prix fixe again. However, when you have a choice, I would definitely go for one of the souffles — it takes 20-25 minutes so please place your order with your server when your entree is served. They come in various sizes and different flavors. 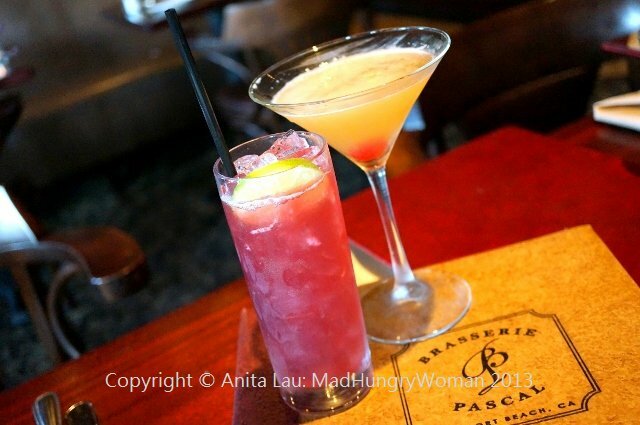 Going out for a French meal can be affordable, especially with these great offerings at Brasserie Pascal. The Sunset Menu is awesome for light appetites while the prix fixe is great for those with bigger appetites. There are a lot of other menu items to explore as well, but that’s for next time. Treat your mother like a queen this Mother’s Day! The Hilton Anaheim is bringing back their “Queen for a Day” Mother’s Day brunch and kicks off a Facebook contest this month. The contests asks entrants why their mom or a special mother in their life deserves to be “queen for a day” and the winner will receive a weekend getaway for Mother’s Day which will include a spa treatment and brunch for their immediate family. Click on the banner on the upper right hand of my blog’s front page to enter! Good Luck! We hope many will seize the opportunity to share stories about the special women in their lives, and look forward to offering a deserving mom some much-needed pampering! 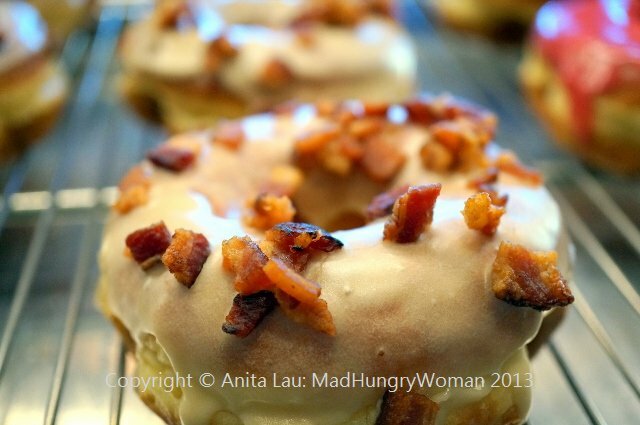 Last year, on designated Saturday mornings, some of us congregated at the test kitchen of SideCar Doughnuts, standing in line to taste something those of us who have been to Portland, OR, or New York City have already had a taste of (Voodoo and Doughnut Plant). 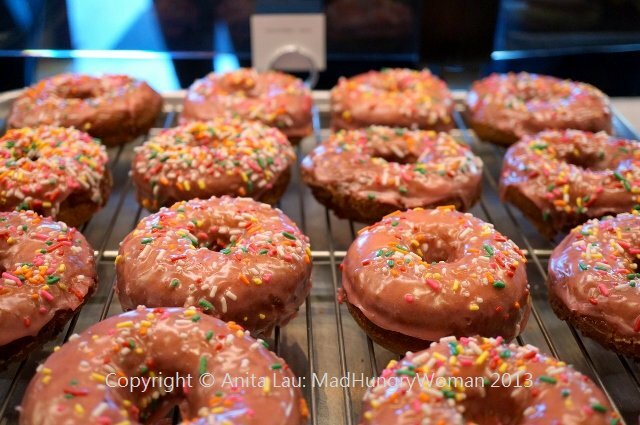 Sure, there are the M&M Donuts, and the Donut Man in southern California, but still, they were nothing compared to the gourmet doughnuts I ate in NY. 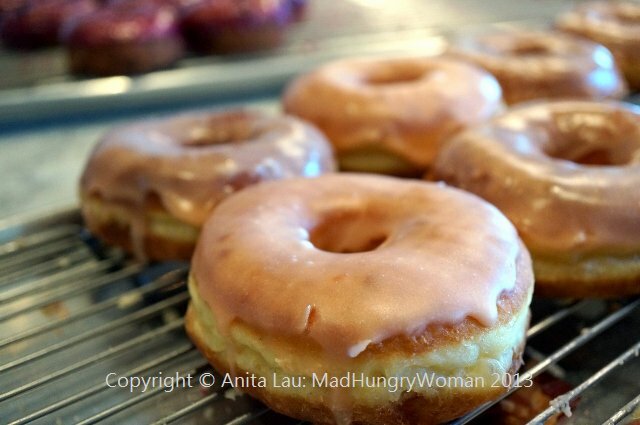 I don’t really eat doughnuts — well, I’ve never until Doughnut Plant — and when I first took a bite of SideCar Doughnuts, I thought “hmmm these are pretty good”. They weren’t sickly sweet and they were light and not dense like commercial doughnuts were. Then came the anticipation of the opening….. waiting, waiting….. waiting…….. The wait is no longer. 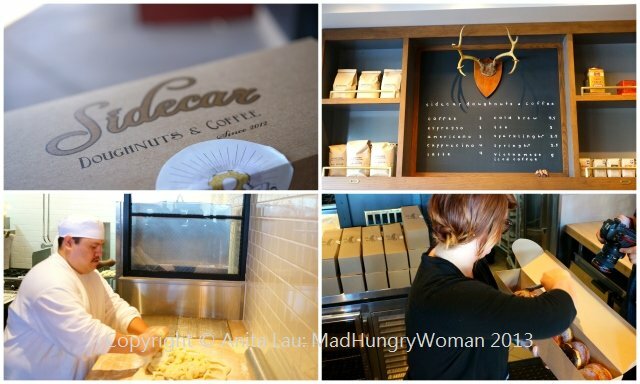 Last Friday, SideCar finally opened and since then I’ve been back three times. I wanted to make sure that my previous experiences with them were not flukes, that they are indeed as good as the last visit no matter what time of day I’m there. I’m glad to report — they are! Each week, the shop features a different array of flavors which are available until sold out, but favorites such as Maple Bacon and Huckleberry will undoubtedly always remain. I guess the “you snooze you lose” phrase is really put to the test here. Check their Facebook page to find out each week’s flavors. Maple Bacon ($3.50), a salty sweet combo perfect for breakfast. They also make a Monte Cristo which I heard is still being perfected, but that was one of my favorites during their test kitchen days. 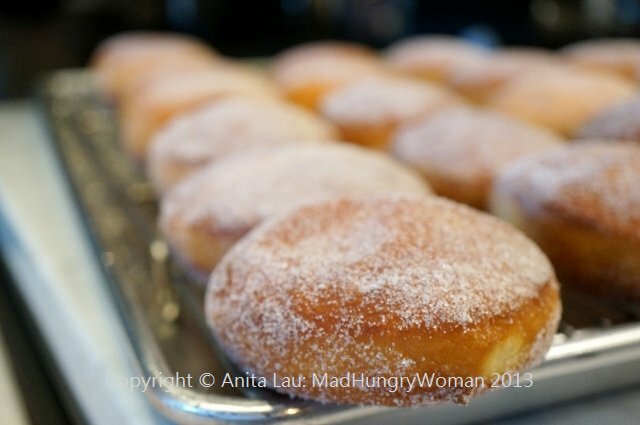 Malasadas were treats while living in Hawaii and while these malasadas aren’t quite Leonard’s, I can honestly say, the one stuffed with haupia ($2), a coconut cream filling is deliciously soft, gooey and the perfect balance of sweetness. There are also plain malasadas for $1.50. I highly suggest eating these right away as they lose a bit of the softness as time passes. 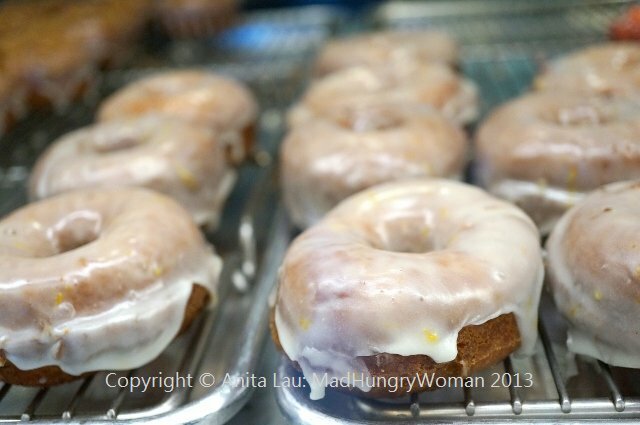 Another awesome offering is the Lemon Meyer Pound Cake ($2.50) essentially a lemon meyer flavored cake doughnut. The scent of citrus bursts into your olfactory senses as soon as you take a bite — aromatic and not too dense. Raspberry is fragrant with a slight tartness — gorgeous fresh fruit explodes in your mouth when you bite into this. 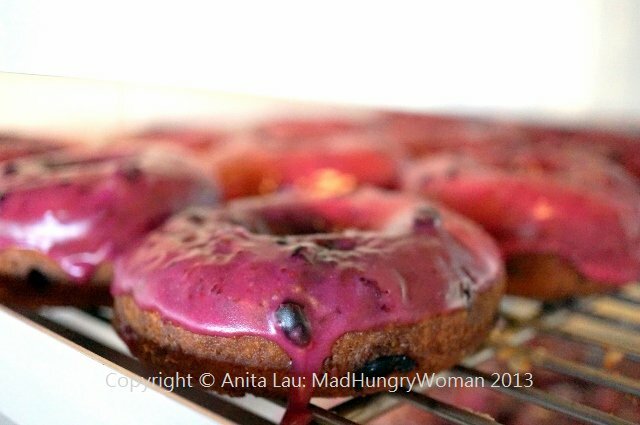 The signature doughnut here is the Huckleberry ($3.50), a cake doughnut with a purple-hued huckleberry glaze topped with crushed huckleberries. The mix of tart and sweet with the fragrance of the berries will make you fall in love with it at first bite. Kids will delight in Birthday Cake ($2.50) complete with sprinkles inside and out. My new found flavors are Guava and Bavarian Cream (sorry, I was in a rush to get them I didn’t see how much they were) and although I could detect the aroma of guava, I would’ve liked a stronger flavor profile inside my mouth. The Bavarian Cream was so delicious I actually ate the entire thing minus a bite for The Hungry Dogg to try. It wasn’t very sweet even though it looked so rich and decadent! 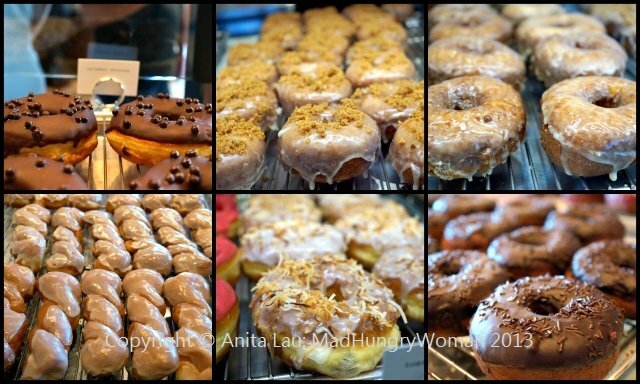 They have a ton of flavors which rotate including: Cinnamon Crumb, Toasted Coconut, Vanilla Twist, Cornbread with Sorghum Brown Butter Glaze, Banana Nutella and much more. No matter what flavor is your favorite, I honestly believe you should treat yourself to one of these once a week! I can’t believe I’m saying this, but as much as I’m not a sweets fan, I’m loving these doughnuts! If you’re a coffee fan, then you’ll love the Stumptown Coffee from Oregon. They open Mon-Fri at 7am and on the weekends, at 8am and closing is determined when everything is sold out! 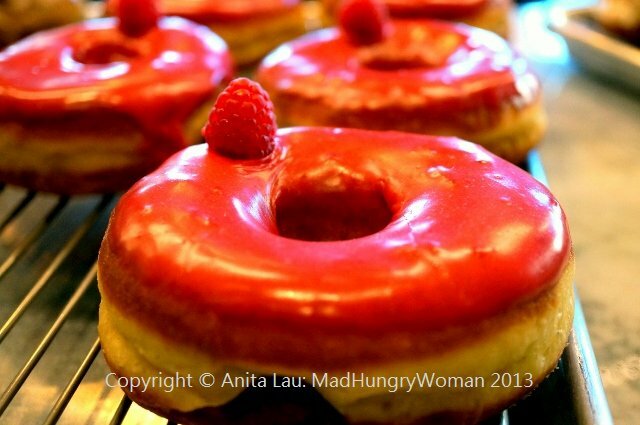 This week I have half a dozen doughnuts to give away to one lucky winner. 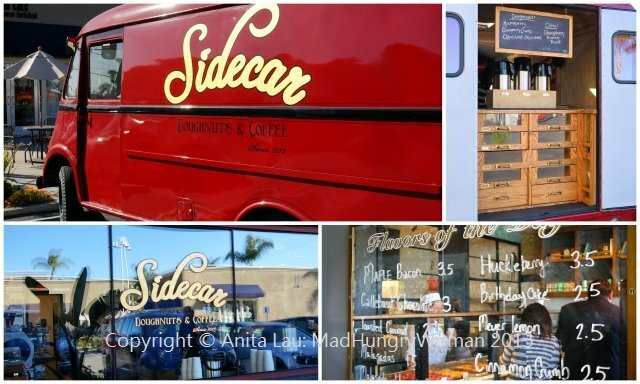 Tell me if you love or do not love doughnuts and why you’re excited to try SideCar out. Leave me a comment with your FULL name for a chance to win. Entries close on Sunday April 21. Winner announced Monday, 22nd. Good Luck! 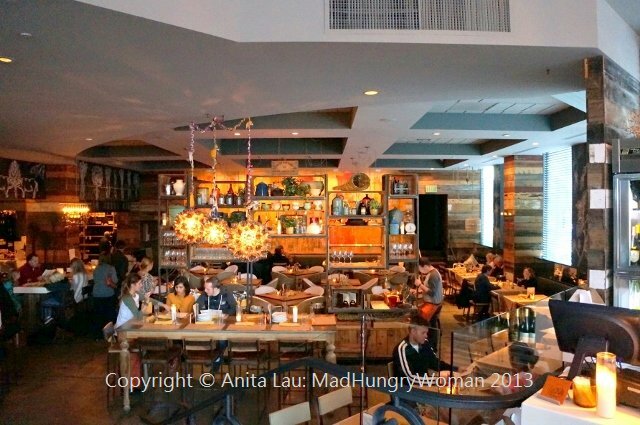 If you’ve been to Cucina Enoteca at the Irvine Spectrum, you’ll probably know that the group’s original restaurant is the eclectic San Diego eatery Cucina Urbana located in the Banker’s Hill neighborhood. I love Enoteca, so on one particular visit to San Diego, I paid a visit to Urbana. 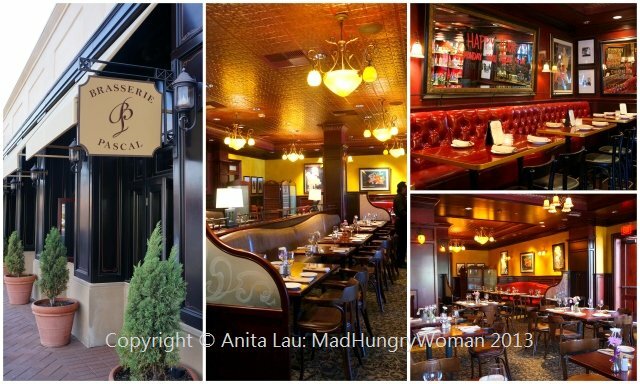 The restaurant is beautiful — as I had expected — and a little smaller and cozier than the sprawling OC location. I always feel like there is so much to discover everywhere I look. We started with some cocktails — Tequila “Mule” ($11) with jalapeno infused tequila, lime juice and ginger beer was my choice being the tequila-lover that I am. My friend happily sipped on the delightful Blueberry Caipirinha ($11) with novo fogo cachaca, lime juice and sugar. 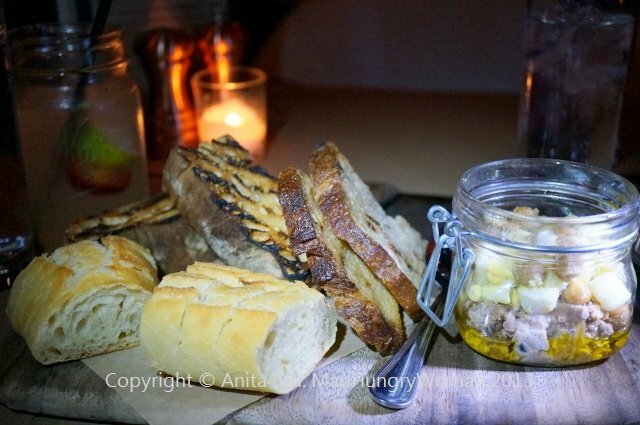 Our server suggested the Tuna Conserva + Ceci Bean + Taggiasca Olive + Farm Egg ($8.50) mason jar for us to start. Ordinarily, I would never have ordered this, but our server didn’t steer us in the wrong direction. It was delicious! I loved the salty tart flavor combo, leaving my mouth puckering for more. 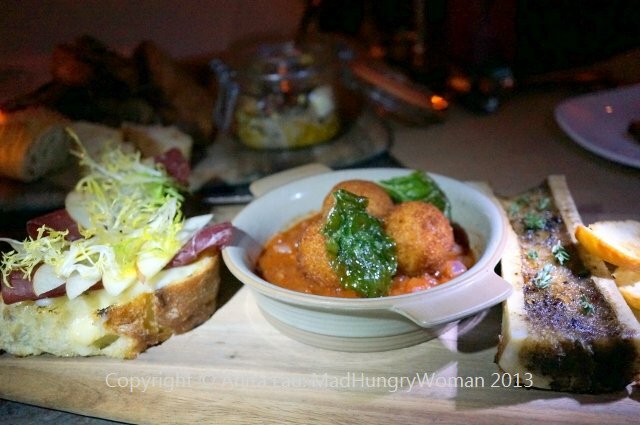 I’ve always loved antipasti boards and the one here comprised of a sampler of three bites: Osso Bucco Bone Marrow, Arancini with finocchio and arrabiata with a San Marzano marinara sauce, Bresaola, Taleggio cheese on crostini. 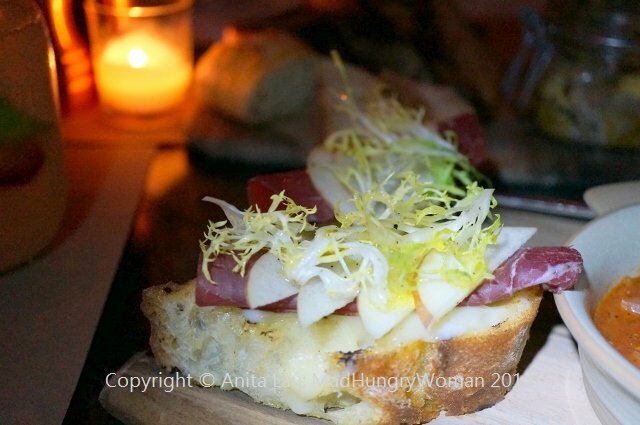 The Bresaola, Taleggio cheese crostini requires no words. Salty, sweet, absolutely delicious bite after bite. 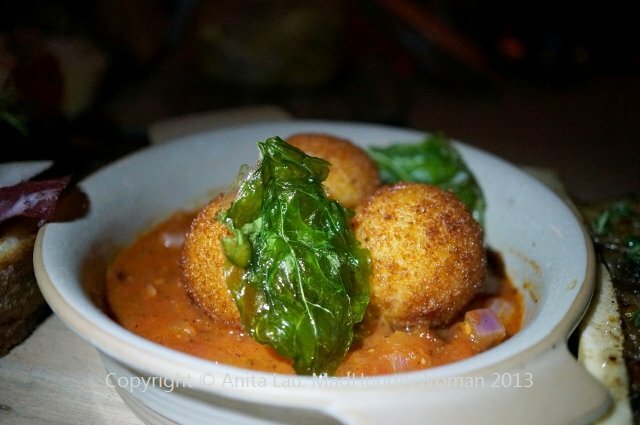 Arancini with finocchio and arrabiata in a San Marzano marinara sauce is light and cheesy. The marinara is perfectly executed and the ideal marriage of flavors. 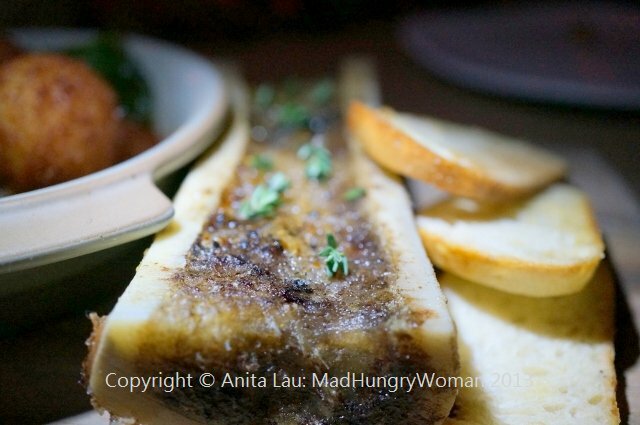 Osso Bucco Bone Marrow is rich, decadent and lately, has taken over the widely missed foie gras. 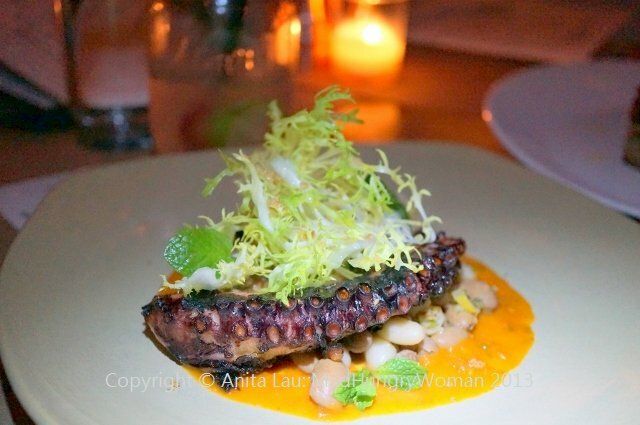 Grilled Mediterranean Octopus ($13.50) brings together tomato sugo, calabrian chili, cannellini bean, bottarga and lemon preserve. 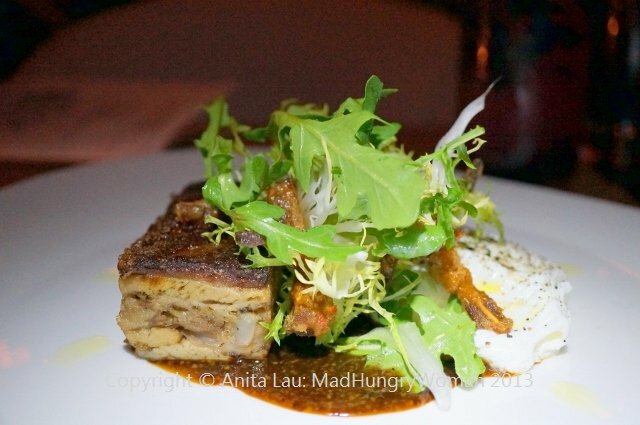 The components in this dish comes together well with textural contrast as well as flavor bursts in my mouth. I had eyed the Roast Suckling Pig ($13.50) because I wanted to see how it differed to the one I’m familiar with from my childhood. The meat was tender with a crispy skin coating just like the one I know but this was also topped with poached hen egg, frisee, pork crackling and a sherry mustard sugo. 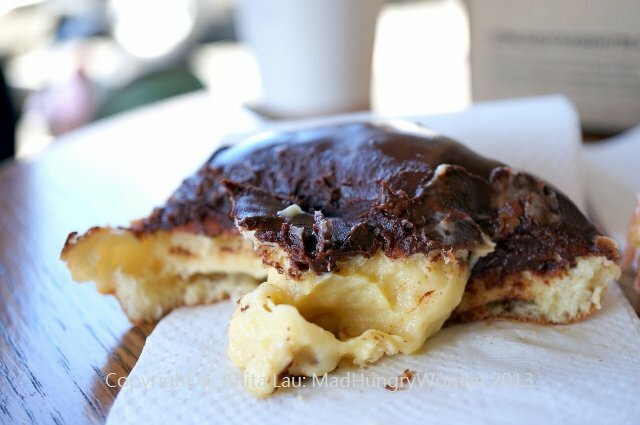 Crispy, gooey, absolutely decadent! Surprisingly, I really enjoyed dessert as well! 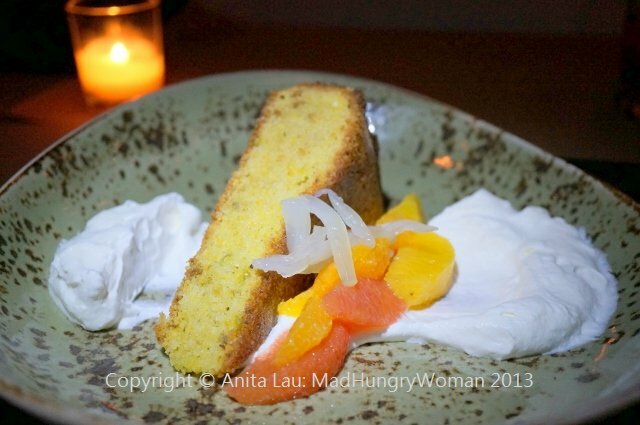 Orange Pistachio Cake ($8) was a moist polenta cake topped with tangerine and candied fennel and a wildflower honey crema. So fragrant and so delicious. Pear + gingerbread spiced tiramisu ($8.50) was also different from the ones I’m used to. Mascarpone mousse, amaretto and almond praline makes this not only a unique tiramisu, but also, a very refined one. Before you go, make a reservation because the place gets packed! You don’t want to arrive and then be disappointed they don’t have a table for you.